I have been trying to enrich my knowledge of Thailand lately. I visit my mother there yearly and wanted to expand my knowledge of all things Thai to be able to appreciate the country better. More so as I wanted to travel across the country and take in the sights. I have been reading some blogs that offer information about backpacking through the country. There are useful tips about what to pack and which medicines to carry and where to stay, apart from the usual tips about what to see. This blog, by Nomadic Matt, curiously, even had a list of books about Thailand as a bonus. When I was last in Thailand and visiting Ayutthya, my mother told me about the story of a king whose family drowned in a canal there. Apparently, you cannot touch a royal person. So when a boat capsized and the Queen and her children were drowning, no one would rescue them for the fear of breaking the rule of physical contact with a Royal. It was such a macabre story, that I was struck by it. My mother also talked about Anna and the King of Siam which has been made into two Hollywood movies. The book, Anna and the King of Siam was on the list of recommended reading by Nomadic Matt.. So was Sightseeing by Rattawut Lapcharoensap with some glowing comments. I discovered Sightseeing on Scribd, which is always an incentive to get to it right away. I was captivated by the first story, Farangs. It was about a boy whose father was an American and the mother, a Thai girl. The father stuck around with them for ten or eleven years before going back to the US. His mother now runs a hostel on a beach. The boy uses his facility with English, learned from his father, to hook farang (foreign) girls. The few pages of the story hit the spot right away. They give us a quick, by no means shallow, look at life in Thailand. This statement is true of all seven stories in this anthology. The stories are about Thai people from the lower end of the social strata, working hard to keep body and soul together. There are young boys trying to cope with loss and grow up in At the Cage Lovely. Draft Day is about a privileged kid dodging draft and losing friendship. 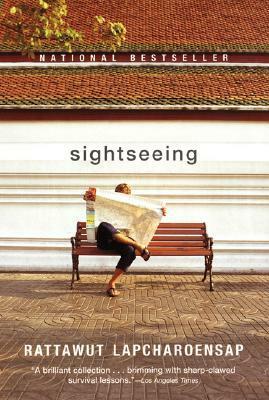 Sightseeing is about a woman who is on a trip before she loses her eyesight. Priscilla the Cambodian (my favorite of the lot) is about the divide between natives and the refugees. This poignant story makes a strong point about the hostility refugees face the world over. Don't Let Me Die in This Place is about an aged American man trying to adjust to a life in Thailand. Cockfighter is about a man trying to hold on his dignity, viewed by his teenaged daughter as she is trying to make sense of her life. The stories are all beautifully written, layered, deep and striking. This, in my mind, is how every author should strive to write. This is Rattawut Lapcharoensap's debut book. He is a Thai-American writer residing in the USA. I have read another story of his on Granta, called Valets, a story about a group of valets who are working at a seedy food joint which was once the pride of Bangkok. Like Rattawut's other stories, this one lingers in your mind too. If you are looking to latch on to a series of books that are unfailingly exciting from book to book, look no further. Of course, you must like historical fiction which are a detective series to boot. For us, Sherlock Holmes is also a historical series, but Brother Cadfael walked in England much much earlier. It was the twelfth century in England. Civil War tore apart the people. King Stephan and Queen Maud strive to claw at power. The aristocracy is divided into two camps. The people, largely unattached to either, hope for peace and prosperity and will sing the praises of any who brings it to them. King Stephan is in the lead for now. Shrewsbury in England is behind the King. In a Benedictine abbey in Shrewsbury, Brother Cadfael is living out his retirement. He was inducted late into the order, after he had served in the Crusade and worked as a Sailor. He has uncommon knowledge of herbs. He is tasked with maintaining the herb garden at the abbey and also tend to sick people. He is shrewd and observant. Time and again he is called upon to solve a mystery. There is a formula is often followed in all the books. There is a murder and also a love story in the secular world. Brother Cadfael gets interested in the murder or is called to help. His knowledge of people and their passions is as extensive as his knowledge of herbs. He makes use of it to solve these mysteries and set the lovers on the right path. Often there is monk in trouble over his faith. Brother Cadfael helps him too. Despite the formula, the sheer inventiveness behind each book makes them virtually unputdownable. I have polished off a complete book at a sitting, a feat I have not achieved much in recent times. Luckily for me, scribd.com has the complete series on its shelves. I am having a whale of time reading them up. I have completed about six or seven of the total twenty so far. The way I am going, I am sure I will finish all of them by the end of this year. The era is faithfully depicted and rings true. I am not knowledgeable enough to vouch for it, but everything sounds right. The language, the clothes, the customs. By and large, the monks and men of God are depicted in a good light. They do have failings, one or two are evil but generally are wise and pious. Same goes for the aristocracy. They are also mostly favorably depicted, with some exceptions. The common people are usually hard working and solid, again, with some exceptions. In short, the times are hard, the war between Stephan and Maud is difficult for the people, but still they are doing well. This may not be the truth, but it makes a good setting for the mysteries when an occasional serpent comes along to cause trouble in paradise. Brother Cadfael is Welsh and there is a lot of reference to the different way of life of Welsh people. Sometimes people from Cadfael's past turn up, with a bit of back story and we learn a little more about the short stout monk bent upon doing the right thing. The core story progresses from book to book, some characters remain constant and some change. At times the monk leaves Shrewsbury on a mission and discovers adventures in a new place. Hugh Beringer, the deputy sheriff at Shrewsbury is the monk's best friend and ally. They often aid each other in solving mysteries. I have enjoyed all the books in the series I have read so far immensely, but the last one I read - Virgin in the Ice was by far the best. There was the mandatory murder, a young love pair and a confused monk, but there was also intrigue, runaways, capture and a battle replete with daring rescues. This was the only book where I could not figure out the murderer. I suppose I will write a bit more about the series after I complete them or after I have read some more books. I hope I have kindled an interest in book lovers about this very interesting series. Labels: 12th Century England, Brother Cadfael, Cadfael Chronicles, Crusades, Ellis Peters, Wales, War. Sometimes a book recommendation can be very rewarding. This book was pushed into my recommended reading by Scribd and I am glad it did. It is a short book of merely 51 pages. A novella or a longish story. Its breathtakingly gorgeous cover is what first attracted me to it. I am glad the 'inner beauty' of the book lives up to its cover. Siew Tsin died at a young age, perhaps only 18. On reaching hell she was met by her great-uncle who promptly sold her to the richest man in hell, Junsheng. Good news is, all the paper money, paper servants, paper mansions, paper gramophones that the devoted relatives burn for their dead forbears does reach them. It can buy them a comfortable afterlife. Junsheng is reveling in the offerings of his successors. Soon Siew Tsin finds out that hell has its own rules, corruption levels and ambitions. She is blind to everything around her, bent only upon keeping herself occupied. When her husband brings home a Terracotta bride, her perspective changes. She has to learn about things going on around her and fast, as she is in danger. Also she learns that one may have to go to hell and back to find true love. The novel is a quick and a heady fix of fantasy. We are flung into an other-worldly atmosphere as soon as we open the book. The Chinese customs of dealing with the dead, tenets of Buddhism, reincarnation and even the Terracotta warriors are mashed together to create this tale. The writing is superb. The sentences are short and elegant. The irony of being alive in afterlife after death is brought out nicely from time to time. She lived, dead, unnoticed by her husband, the household, and even by her own self. Until the terracotta bride came. 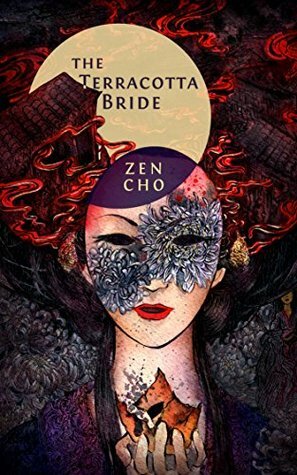 I was so impressed by Zen Cho, that I immediately read another book by her, another short novella. More about it later. This is surely an author to watch. I often fantasize about books written by amateurs, maybe for self indulgence or for the pleasure of a few friends. They maybe typewritten or even hand written, filling a few pages and ordinary copy books. They maybe be manuscripts by authors who never found publishers, or merely diaries by people meant to be kept secret and to the heart. These could be works to rival those of great masters, worthy of being read by many people and called classics. So many beautiful books out there destroyed because they were private or neglected. Why, even Jane Austen nearly suffered oblivion at one time. Now we cannot imagine literary scene without her. 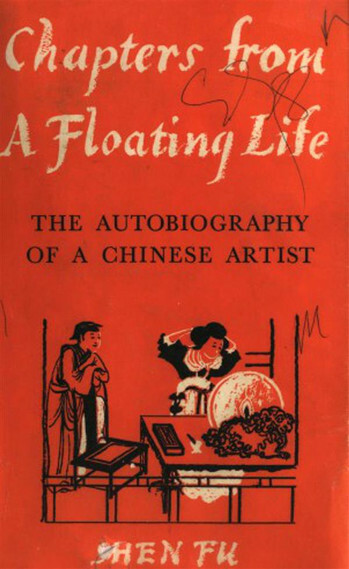 It was happenstance that led Yang Yin to a bookstall where a manuscript lay among second hand books. Yang Yin was the brother-in-law of Wang Tao, who was a prominent writer and an editor of Shan Bao, a prominent Shanghai Newspaper. These two meritorious gentleman rescued the beautiful autobiography of Shen Fu, a painter, from oblivion. The book became a instant hit with the readers of Shan Bao in 1877 and is still being read. Shen Fu lived from 1763 to 1825(?) during the Qing Dynasty. Whatever we know of his life is recorded in his book. Out of the possible six chapters only four were recovered. He had a lovely childhood in the lap of nature and was fortunate to find a soul mate in his cousin Shu Chen (or Yuen). They had an enviable married life without much discord. What plagued their life was their poverty. Shen Fu was a painter but he could not eke out a living with this. He often picked up work as a Yamen (secretary), but there was no permanent work and the couple was always in debt, forced to pawn their belongings and move from place to place (hence, floating life). The book is lovingly translated by Shirley M Black. It is said to be very poetic in Chinese, you get the same idea when you read Shirley Black's translation. It is equally poetic and gives you the impression of floating down the river in a gently rocking boat. It was impossible to find any details about the translator. However, the foreword states that she rearranged the sequence of the book and modified some parts of the original book to make it easy for the western reader. Ever since I learned that, I have been wanting to find some other translation that provides the text in translation as it is. I hope to learn more about it. The book has been adapted into a ballet. I feel it could make a beautiful movie as well, starting with the discovery of the manuscript, its popularity, search for the missing chapters that segue into the captivating story of Shen Fu. Sarah is rich. She has a privileged life, high profile parents a steady boyfriend. Lauren is the beauty, she works hard for her living, is doing very well. She is not able to sustain a relationship much. Sarah and Lauren have been friends since school. They have kept in touch throughout their twenties and thirties as well. Yet, it is Sarah who is the manager of this relationship. She is the one who calls Lauren, fixes lunch appointments, keeps connected. Lauren seems merely to respond. Lauren has many temporary relationships, which seem to go well at the outset. Yet the minute Sarah starts feeling that this one is real for her friend, Lauren breaks up. It is almost as if Lauren cannot stand any scrutiny of her personal life by her friend and set out to destroy it. It is almost as if Lauren does not really want to be friends with Sarah, it is like Sarah does not want to let her go. There is no particular plot in the book, it covers a few decades in the lives of Sarah and Lauren, from growing school girls to young women in their thirties. They keep true to their types throughout. At the end of the book, Lauren is more committed to being friends with Sarah, she is the one anchor in her life. She is her family and her center. This is art imitating life. Our life has some milestones, but our stories do not 'end' at any particular point, unless you start with birth and end with death. Alam is able to be in the moment and describe whatever is happening with conviction. Whether we are looking and Sarah and Lauren playing as school girls, or Sarah declaring her engagement to Dan (her long time boyfriend). 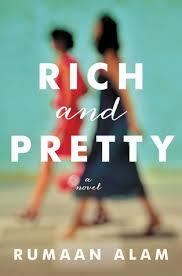 We get a distinct impression that we are trespassing on the lives of two good friends with the help of the author. I read this book a while ago and was impressed by it. Even though at times I felt like it was flat reading, understandable, as the intent of the author is not in giving us 'hooks' and 'denouements'. Instead we are allowed to travel with the girls for a few decades of their lives. 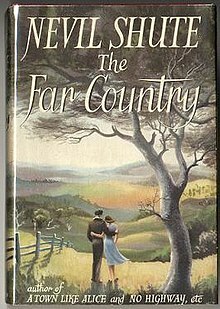 Nevil Shute is an author who never disappoints. His books are charming and weighty. He often makes a socially relevant comment through his books. In his book 'On the Beach' he explored the idea of the world coming to an end because of nuclear radiation. In this book we find how war hits everyone's lives. Post-war England is impoverished. 'Doctors are earning less than dentists.' says Ethel Trehearn. She is the widow of a Civil Servant who served in India. Her husband provided well for her but life had other plans. England left India and the pension funds dried up. The proud old lady is reduced to starvation. Medical aid is in shambles. The hospitals cannot accommodate an old lady who is ill. Her family, a daughter, her husband and a granddaughter are busy trying to eke out a living themselves. Mrs. Trehearn does not let on that things are difficult. She starts selling excess furniture and little bits of jewelry to survive. Until one day she faints from starvation. Her granddaughter Jennifer Morton comes to look after her and discovers how bad things are with Ethel. Ethel has a niece in Victoria, Australia and has been corresponding regularly with her. The niece, Jane Dorman worries about some things that her aunt wrote and sends her a cheque for 500 pounds. Ethel is too far gone to enjoy the money and hands it over to Jennifer. She urges her to go away to Australia. Jennifer meets a lot of people during this time who seem to advocate emigration and are disillusioned with the way things are in England. Jennifer finds Australia very beautiful. Her aunt, Jane Dorman is affectionate and accommodating. Jennifer is determined to explore Merrijig, Victoria, to the fullest. She goes everywhere with her uncle, even to far off timber camps. It is here that she meets a Czech Emigre Carl Zlinter. He used to be a doctor in the Czech army. He is a highly qualified surgeon. But according to Australian immigration laws, he has to work for two years as a laborer. After that, he has to appear for an examination to qualify to serve as a Doctor. This girl from England and this doctor from Czechoslovakia fall in love. There are too many impediments in their way though. Carl cannot work as a doctor for many years yet, he has no money to qualify as a Surgeon again. Things are pretty hopeless for the young couple in love. Yet they decide to make the most of the time they have together. A little mystery pops up when they discover that there was another Carl Zlinter, a buggy driver who lived and died in Merrijig. They do not know but this long dead Carl Zlinter does hold a key to their happiness. Unlike the ominous 'On the Beach', 'The Far Country' is a sweet little romance. The times are hard and everyone is suffering, yet young people will find their way into love. I read this book years and years ago when I was a teenager. I read it again to refresh my memory and write about it. It is such a sweet book it deserves to be read by the younger set. For quite some time it was hard to get any of Nevil Shute's books. Now I am glad Vintage Classics is publishing some of his well known titles. I need to read some more books by him, he is such a marvelous writer, he never disappoints. He has a great imagination and writes in a way that makes us empathise deeply with his characters. In 'The Far Country' we learn so much about people who have left their homes in search of livelihood. Mario comes from Italy and is desperate to make enough money to bring his sweetheart over. Carl Zlinter cannot think of marrying as he has no money to settle down. Jennifer has also seen many hardships in England, the sight of plentiful tables in Australia amaze her. We feel deeply for them.